We all know the mood-boosting benefits of a good laugh, but researchers at California's Loma Linda University set out to find out if humor can deliver more than just comic relief. The study looked at 20 healthy older adults in their 60s and 70s, measuring their stress levels and short-term memory. One group was asked to sit silently, not talking, reading, or using their cellphones, while the other group watched funny videos. After 20 minutes, the participants gave saliva samples and took a short memory test. While both groups performed better after the break than before, the "humor group" performed significantly better when it came to memory recall. Participants who viewed the funny videos had much higher improvement in recall abilities, 43.6 percent, compared with 20.3 percent in the non-humor group. Moreover, the humor group showed considerably lower levels of cortisol, the "stress hormone," after watching the videos. The non-humor group's stress levels decreased just slightly. Other studies have also shown the wide-ranging health benefits of laughter. A Vanderbilt University study estimated that just 10-15 minutes of laughter a day can burn up to 40 calories. Meanwhile, a University of Maryland study found that a sense of humor can protect against heart disease. Lower cortisol? Lower stress? Sounds pretty good. But researchers insist the benefits are even greater. “There are several benefits to humor and laughter," explained Gurinder S. Bains, a Ph.D. candidate at Loma Linda University, who co-authored the study. "Older adults need to have a better quality of life. 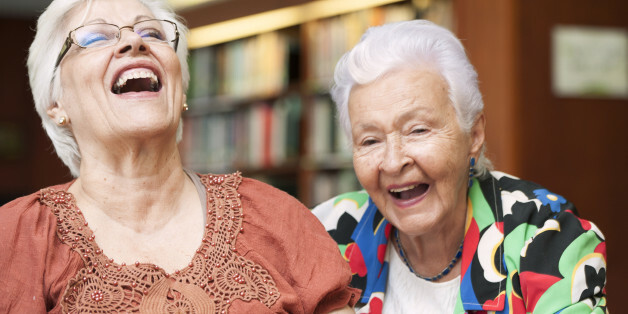 Incorporating time to laugh, through social interaction with friends, enjoying exercise in a group setting, or even watching 20 minutes of humor on TV daily, can enhance your learning ability and delayed recall."